Sabato's Crystal Ball has updated a few race ratings for the November elections. They also discuss a few other contests where changes were considered, along with a recap of this past Tuesday's key primary results. 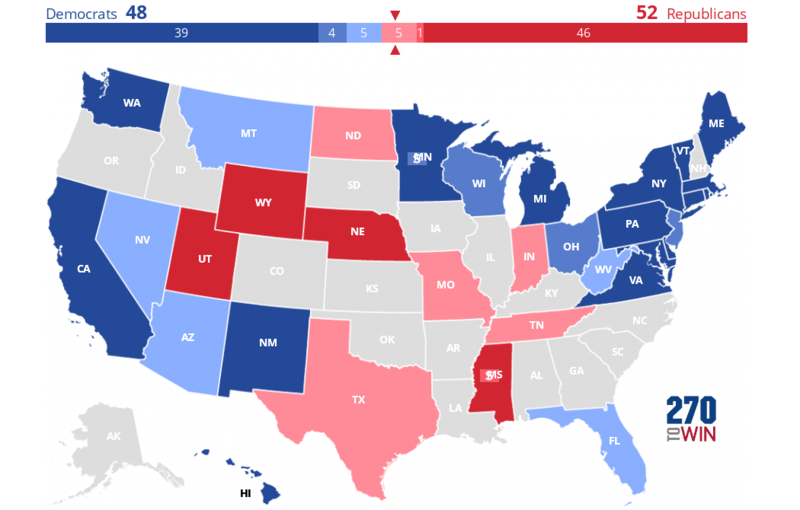 The maps below reflect their current ratings for Senate, House and governor. Click or tap any of them for an interactive version. Republicans currently have a 51-49 edge; Democrats need a net gain of two to take control. That is an uphill climb in a year where the party is defending 26 of the 35 seats up for election, including 10 won by Donald Trump in 2016. Of the 54 seats seen as most competitive (rated toss-up or leaning), Republicans hold 49 of them. This includes the vacant OH-12, which will be filled by a special election in August. 218 seats are needed for control. There are 36 gubernatorial elections in 2018. On Tuesday, North Carolina Republican Rep. Robert Pittenger lost his battle for renomination to pastor Mark Harris. He is the first House incumbent to lose a primary challenge this year. With this involuntary retirement, there are now 54 current members of the U.S. House not running for re-election to their seats this November. Of the 54 departures, 11 were running for U.S. Senate at the beginning of the week. That number is now eight, as three of the four that had primaries on Tuesday were defeated. In Indiana, Reps. Todd Rokita and Luke Messer were defeated, as was Rep. Evan Jenkins in West Virginia. Only Rep. Jim Renacci of Ohio moved on to the general election. The full list of retirements has been updated. Note that one of the 54, Rep. Charlie Dent of Pennsylvania is expected to resign in the upcoming weeks. The New York Times has pages set up to track the results for today's primaries in West Virginia, Ohio, Indiana and North Carolina. Click or tap the state name below. All times are Eastern. In addition to the statewide races mentioned below, there will be primaries for the U.S. House, and various state/local races. West Virginia: Polls close at 7:30 PM; the first results are anticipated at 7:50 PM. The three-way battle for the Republican U.S. Senate nomination is the biggest race. Incumbent Democratic Sen. Joe Manchin is expected to easily win renomination. Ohio: Polls close at 7:30; results should begin to arrive by 8:00 PM. Five candidates are vying for the Republican U.S. Senate nomination. Incumbent Democratic Sen. Sherrod Brown has no opposition. Both parties have a competitive primary for governor; incumbent John Kasich cannot run due to term limits. There's also an interesting question about redistricting that is being voted on. The current process has left the Buckeye State as one of the most gerrymandered in the country. Indiana: Polls close in most of the state at 6:00 PM; the Central Time Zone areas close at 7:00 PM. As in West Virginia, three Republicans are battling for the nomination. Democratic Sen. Joe Donnelly is running uncontested. North Carolina: Polls close at 7:30 with results expected shortly thereafter. Neither U.S. Senate seat is up in 2018. Tuesday brings the busiest primary day of 2018 thus far, with voters in four states going to the polls to choose party nominees for the November 6th midterm elections. Republicans in three of those states, all won easily by Donald Trump in 2016, will choose nominees to face off against Democratic Senate incumbents. Polls in North Carolina, Ohio and West Virginia will close at 7:30 PM Eastern Time. In Indiana, polls close at 6:00 PM local time. That's 6:00 PM Eastern for most of the state; 7:00 PM Eastern for the sections in the Central Time Zone. A summary of the three Senate races follows. President Trump tweeted that Blankenship can't win in November, telling voters to choose one of his two opponents, Rep. Evan Jenkins or Attorney General Patrick Morrisey. 'Two' is the problem here for the GOP. It is entirely possible that those two split the mainstream vote while Blankenship wins a plurality. That scenario would significantly brighten the re-election prospects of Sen. Joe Manchin in a state Trump won by 42% in 2016. Three Republicans are also competing for the nomination in this state that Trump won by 19%. Reps. Todd Rokita and Luke Messer don't like each other, although they and former state lawmaker Mike Braun all really like the president. The winner of today's primary will face incumbent Sen. Joe Donnelly. Trump won Ohio by 8% in 2016. While a more competitive result than West Virginia or Indiana, it was the largest presidential margin of victory in that bellwether state since George H.W. Bush beat Michael Dukakis by 11% in 1988. Rep. Jim Renacci is squaring off against banker Mike Gibbons and several others. All recent polling is like this one: Renacci is ahead but with a huge amount of undecided voters. The winner will meet incumbent Sen. Sherrod Brown. Aside from Memorial Day week, the next month will be very active. Here's the full calendar. The 2018 House Election Forecasts page is now live. At this URL, we'll keep track of the current projections from a number of forecasters. At present, these include Sabato's Crystal Ball, The Cook Political Report, Inside Elections, CNN and The Crosstab. Click or tap any of the maps on that page for a full interactive version. 'Starting Views' have also been added to the 2018 House Interactive Map. These include some of the above, as well as a blank map, for those that want to start from 0-0. The default map displays a wide look at the most competitive races, based on one or more of Sabato/Cook/Inside Elections rating it as toss up or leaning. That map is also below. There are currently 64 races meeting this criteria. Similar forecaster pages also exist for the 2018 Senate and 2018 gubernatorial races. Pennsylvania Gov. Tom Wolf announced Wednesday that the special election to fill the vacancy in the state's 7th congressional district will take place on Tuesday, November 6th. This is the same day as the general election. The incumbent, Republican Pat Meehan, resigned last Friday. Wolf said he will handle any subsequent openings the same way, unless they occur within 60 days of the general election. This will cover an upcoming vacancy in the 15th congressional district. That incumbent, Republican Charlie Dent, has announced his intention to resign at some point in the next few weeks. Complicating matters is a new congressional map imposed by the state Supreme Court that will be effective - for representation - beginning with the new Congress in January. Voters in all of the state's 18 congressional districts will choose party nominees based on the new district lines in the May 15 primary, with the vote for a two-year term on Election Day, November 6th. However, any special election will take place based on the existing boundaries, with the winner serving out the final two months of the current congressional term. The respective parties will choose the nominees for any special election. This sets up the possibility that the nominees and/or winner of any special election might be different than for the general election. The court ruling has made both successor districts more Democratic. The existing 7th congressional district voted for Clinton over Trump by 2% in 2016. The new 5th district voted for Clinton by 28%. It is rated safe Democratic for the general election. Meanwhile, the existing 15th district voted for Trump by about 8% in 2016. The new 7th district - not to be confused with the existing one discussed in the prior paragraph - voted for Clinton by 1%. It is rated toss-up for the general election. Rep. Pat Meehan resigned from Congress Friday, effective immediately. The four-term Pennsylvania Republican had already announced he wouldn't run in 2018 after revelations that he used taxpayer money to settle a sexual harassment case. Meehan will reimburse the $39,000 paid out in that claim. Per Pennsylvania law, Gov. Tom Wolf must declare the date for a special election within 10 days, with the date of that election to be at least 60 days after the announcement. Complicating matters is this year's redrawing of the state's congressional districts, ordered by the state Supreme Court after it was determined that the current map was an unconstitutional gerrymander. Whether one agrees with the ruling or not, Meehan's 7th congressional district, nicknamed 'Goofy Kicking Donald Duck', is one of the most gerrymandered in the country. At its narrowest point, the district is the width of a hospital complex, with the 6th district to the north and the 16th to the south. The special election to complete Meehan's term will take place in this existing 7th district. That will be the case even if the election coincides with the November 6th midterms. This is a toss-up district with no incumbent: While Meehan won reelection by about 20% in 2016, Hillary Clinton beat Donald Trump here by 2 points. About half the 7th district is becoming part of the new 5th district, which is safely Democratic. If a Republican wins the special election, their time in Congress will likely be short, unless that person is also on the November ballot in another, more GOP-friendly district. There are now 7 vacancies in the U.S. House, which is comprised of 235 Republicans and 193 Democrats. Republican Debbie Lesko (AZ-8) won a special election this past Tuesday to fill one of the open seats. A new vacancy is expected during May, as Meehan's colleague, Rep. Charlie Dent announced in mid-April that he will depart in the coming weeks. On the heels of Tuesday's narrow Republican win in Arizona's 8th district, we have an updated outlook and some ratings changes from the forecasters at Sabato's Crystal Ball. Ratings changes were made to 15 districts, including 10 new races that moved from safe to likely Republican. "Overall, our House outlook remains the same: Democrats are about 50-50 to win the House. What these ratings change do is make clear that in the event of a big wave, there are some districts that might not seem competitive on paper that could flip, particularly because a deep bench of Democratic candidates is in place to capitalize on a potentially great environment in the fall. That’s where one could see Democrats picking up substantially more than the 23 net seats they need to win House control. However, the Democratic wave could fail to materialize, and Democratic gains could be limited to the teens. At this juncture, the range of possibilities in the House is wide. We realize that may be an unsatisfying and overly cautious assessment, but that’s where we’re at right now with the election still half a year away." As most of the shifts were from safe to likely Republican, the overall forecast changes little, although the map isn't quite as dark red as it was. Republicans are favored in 211 seats, Democrats 198, with 26 toss-ups. Click the image for an interactive version. Note that we've added a 'Map Options' link, near the share buttons, below Florida. For those that don't want to rotate through as many colors when creating a forecast, you can choose a smaller palette there. The latest ratings changes are in the table below. They include some high profile names. Read the full analysis for more background on these individuals and the rationale for the current rating. Republican Debbie Lesko won the Arizona 8th congressional district special election Tuesday, defeating Democrat Hiral Tipirneni by 5 points. While the GOP prevailed, Democrats outperformed history and expectations in this conservative district. This continues a trend that has occurred in every special election since 2016. In this particular district, the prior incumbent Trent Franks won reelection by 37% that year, while Donald Trump bested Hillary Clinton by 21%. At this point, only OH-12 looks competitive. The remaining districts are expected to stay with the incumbent party.